The 6.5 Inch Wirless Trolley Speaker has built-in MP3 player supports USB and SD memory cards. The portable amplifier trolley speaker convenient telescoping handle and trolley wheels. The trolley speaker can with wireless mic including master volume, treble, bass, echo, MIC volume. The 6.5" trolley speaker cabinet is black and blue. Although the appearance is not very fashionable, the speaker uses a sturdy wooden box, which can effectively suppress the resonance inside the box and bring pure and natural sound. The volume adjustment and low-frequency gain knobs are designed on the side of the speaker, allowing the user to adjust to their listening preferences to enrich their listening experience. 1. 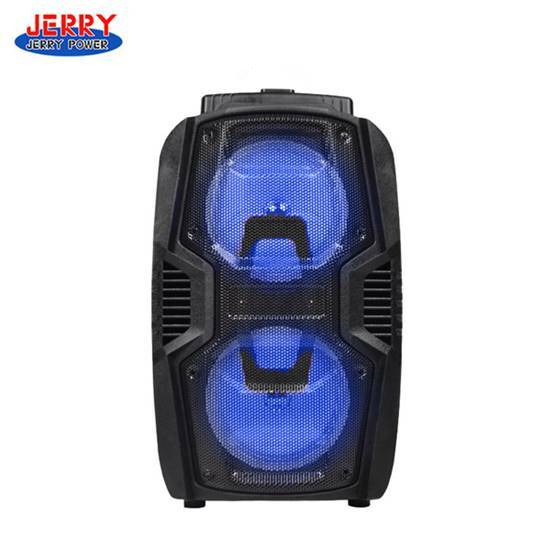 6.5 Inch Wirless Trolley Speaker supports mobile phone/speaker audio and video synchronization, supports Bluetooth wireless connection, and is easy to use outdoors. 2. It is equipped with a USB interface, supports U disk to play music, advertising video, and supports downloading to U disk or SD card. 3. The device has a built-in rechargeable battery, which can be played continuously for about three hours. 4. The bearing pulley at the bottom is smaller than the loss of the ordinary pulley, which effectively guarantees practicability. 5. It can effectively connect to computer, mobile phone, DVD and other audio sources.